A simple elegant style with a few surprises. RW: Elsie Piddock (from ‘Elsie Piddock skips in her sleep’, by Eleanor Farjeon), so I could skip a high skip, a low skip and a strong skip. JB: I’d go to 1988 to Missouri to meet Peter Quill, the Guardian of the Galaxy. RW: I’d go to the Skull Cave to have adventures with the Ghost Who Walks. RW: Don’t worry about what people think of you. We wrote Joshua and the Two Crabs to show the excitement of crabbing in the mangroves in Broome; we wrote Steve goes to Carnival to show how good life can be when you have friends. 11. What is your favourite word in Steve goes to Carnival? JB: ‘drifting’ — the sound of musical notes coming out of the jazz club. RW: ‘favela’ — the name for the shanty towns in Rio de Janeiro, originally called after a beautiful Brazilian flower. Joshua Button is descended from the Walmajarri people of the East Kimberley in Western Australia and Robyn Wells has lived in the Kimberley region for many years. Joshua first worked with Robyn in a literacy program at primary school that resulted in the picture book Joshua and the Two Crabs (Magabala Books, 2008). 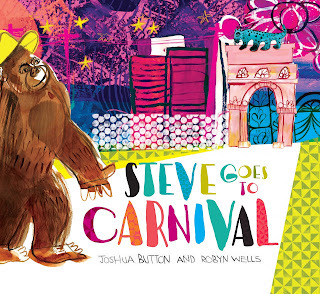 Their latest collaboration is the picture book Steve Goes to Carnival, also published by Magabala Books.